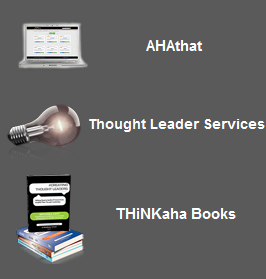 #CREATING THOUGHT LEADERS tweet Book01 | THiNKaha: Become a recognized expert in your field of expertise. Compelling thought leadership content. Section I: Why Should You Be a Thought Leader? Section II: What Does It Take to Be a Thought Leader? Section III: Who Made the Transition to Thought Leader? Section VII: You Need H.E.L.P. Section X: What Else Should You Be Doing or Thinking About? In today’s world where an organization’s prospect has access to more information about the industry, key firms within that industry, and customer testimonials of those using products and services from companies in the industry, how can any organization stand out? In some industries, buyers have conducted 75 percent of their research on the Internet prior to talking to any firms to make their purchasing decisions. How do you make sure that you are not only at the table, but have a strong seat at it? It’s simple. Two words: thought leadership. With the changing environment that the Internet and social media is bringing about, it’s not as much about the global organization, but the individual experts turned thought leaders in the organizations whose names you associate with expertise in their respective niches. These thought leaders are being helped by their organizations to crowdsource books and eBooks, write articles, blog, tweet, speak at conferences and webinars, as well as to get quoted in traditional media on events and trends in the marketplace. Through them, the organizations’ messages are being amplified in the marketplace. Mitchell Levy on Creating Thought Leaders (2nd Edition) helps the experts inside organizations think about and act on becoming thought leaders. Sections of the book include: why organizations should do it, what does it take, who else has made the transition, benefits they will receive, how they need to craft and define their message, and what H.E.L.P. they need to get to get to the next level. If you are tapped by your organization to be a thought leader or are considering just diving in and taking the lead yourself, this book is for you. 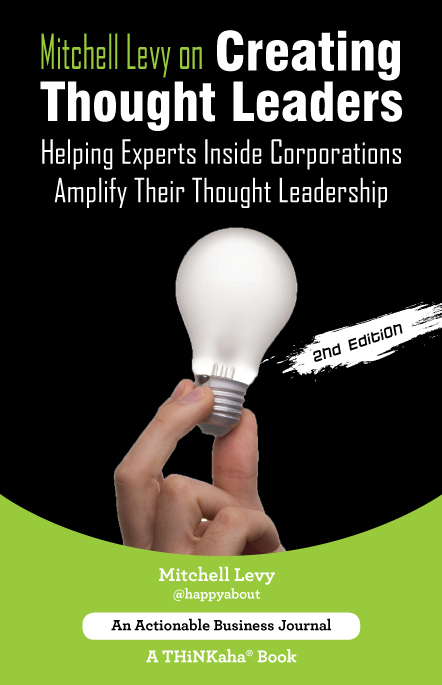 This aha from the beginning of the book should appeal to the organization: “Prospects making purchasing decisions are looking for thought leaders in their space to learn from before taking action” (#54). The last aha of this book should appeal to the expert: “Being a thought leader is one of the most rewarding positions to be in life. Why not work to make it yours!” (#140). You owe it to yourself to pick up and read this book … more than once! Mitchell Levy on Creating Thought Leaders (2nd Edition) is part of the THiNKaha series whose slim and handy books contain 140 well-thought-out quotes (tweets/ahas). 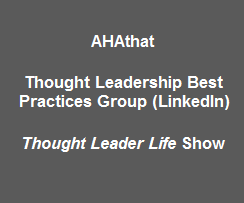 Mitchell Levy is The AHA Guy at AHAthat and the CEO and Chief Instigator of AHAs at THiNKaha®. He and his team make it easy for corporations to easily create compelling content that help turn their experts into recognized thought leaders. Mitchell is an international bestselling author with fifty eight business books and a contributor at Entrepreneur Magazine, has provided strategic consulting to over one hundred companies, has advised over five hundred CEOs on critical business issues through the CEO networking groups he's run, and has been chairman of the board of a NASDAQ-listed company. In addition to these accomplishments, he’s been happily married for twenty-eight years and regularly spends four to five weeks annually in a European country with his family and friends. Mitchell is committed to aliveness, joy, and AHA moments. Read more and connect with Mitchell at www.mitchelllevy.com. – Gino Blefari, Founder, President & CEO, Intero Real Estate Services Inc.